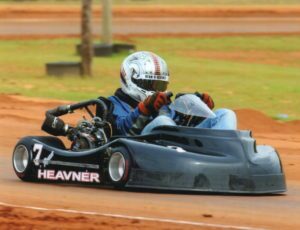 Two dirt oval karting championships for Ryan Heavner in 2017. 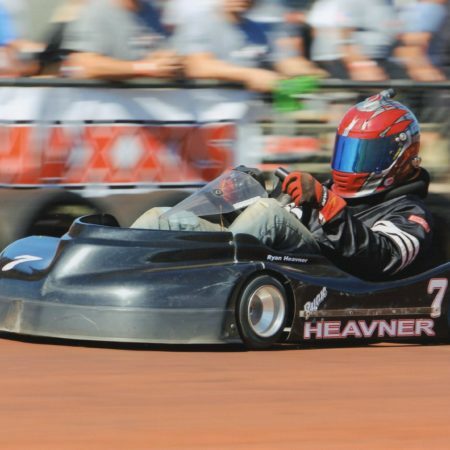 Ryan Heavner Racing was set to fight for both titles at Liberty Raceway Park. However, the season ending Champions on Dirt Series has been canceled due to snow. As a result, Heavner has been awarded the championship in both classes after the 4 events run. 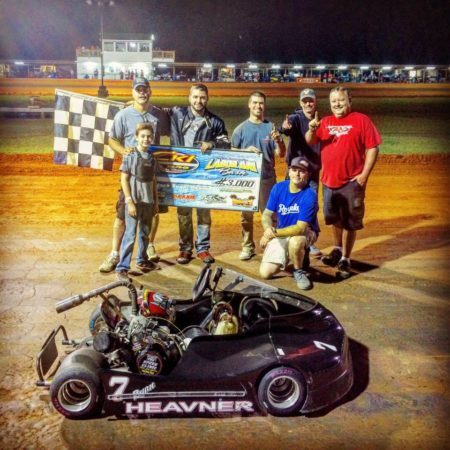 Ryan Heavner won the FK Clone 400 division by exactly 100 points. He opened the season in a hole after a 9th place run in the debut round at Liberty Raceway Park. After that, he immediately started digging with a win, 5th and 3rd. Three straight top 5 finishes put him at the top of the board in drivers’ standings. There were 4 races in the FK Clone 425 class, Ryan Heavner had a worst finish of 2nd. A race win and 3 runner-up finishes have presented him with the championship. The dual championship result softens the blow from the Tri-State Pro Series ending result. Heavner lost the Stock Super Heavy title by just 3 points. Heavner won 2 races out of the 6 on the schedule. Despite that, he came up just short, ending up tied for 2nd. Ryan Heavner Racing is scheduled to run the Winter Series. That series is already underway, the second round will take place this weekend at Fastrax Kartway. There’s only a microscopic break in the action following the weekend of dirt racing. The team will return for the New Years Bash at Paradise Raceway. The Tri-State Pro Series banquet is scheduled for January 2018. It’s been the goal all year. However, since round 3 the team has been digging themselves out of a hole. Round 4 put Ryan Heavner Racing trending in the correct direction. Ryan Heavner swept the weekend. He took both poles and both wins in the Pro Super Heavy as well as the Super Heavy divisions. 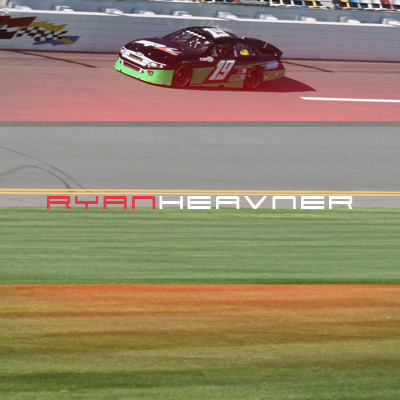 Ryan Heavner went into the 5th round of the championship last weekend. The team unloaded at Paradise Raceway with one goal; to chip away a little more in the championship point battle. He was on pace to do it! Ryan Heaver sat on pole in the Super Stock Heavy division. The green dropped and he maintained the lead. 4 laps remained, Heaver was en route to the win. While leading, the hub broke on the chassis. Ryan Heavner was force to a DNF result. The crew swept that result from their minds. They went to work on the setup for the following Pro Super Heavy race. Repairs were made but the setup was missed. After starting 3rd Heavner fell through the field. He finished 13th in Pro Super Heavy. It was a costly weekend. Ryan Heavner now sits 2nd in Pro Super Heavy points. He’s just 4 points behind Clint Cash. In the Stock Super Heavy division Heaver is 5th in points, 17 points behind the point leader. Only 1 race remains on the 2017 Tri-State Pro Series schedule. The championship is still up for grabs in the Pro Super Heavy division. Stock Super Heavy, it’s possible but it would take a miracle. The final round of the Tri-State Pro Series takes place this weekend at the Georgia Karting Complex. Then, Heaver will head to the Nationals in Neeses SC. Ryan claimed the Stock Heavy Animal National Champion at Thunder Valley Speedway in 2016. This year, he will be competing for the Super Heavy Championship on Sunday. After that, Heavner will head to the 24th Annual Thanksgiving Thunder. The event will also be hosted at the coveted Georgia Karting Complex. That event in on November 23-25th.